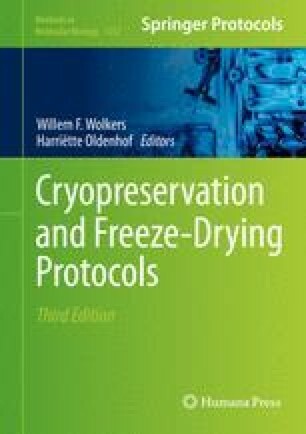 Cryopreservation is currently the method of choice when it comes to long-term preservation of viable biological samples. The process, and consequently the volume of the sample, however, is limited by the ability to achieve homogenous and efficient heat removal. When this cannot be properly managed, ice crystals will grow uncontrollably resulting in extensive damage to the cryopreserved cells or tissues. Directional freezing is a technique that can be used to precisely control heat dissipation and ice crystal growth and morphology even when freezing large volumes. The technique has been used over the years to cryopreserve spermatozoa, oocytes, embryos, tissue slices and whole organs from a wide variety of domestic and wild species. In this chapter a protocol for directional freezing of spermatozoa is described and its benefits and shortcomings are discussed. The author is grateful to Dr. Amir Arav for useful suggestions on the manuscript, and to Drs. Roland Fray and Gabriela Galateanu for help with the figures.